African American families; feelings of hope and unity; racial prejudice; characters who overcome seemingly insurmountable obstacles -- these are some of the themes you will find in almost any given novel by Patricia McKissack. Written primarily for audiences ages 10-14 years old, Patricia develops her characters so that readers will be able to relate to them almost as well as they might relate to a friend at school. You will root for these characters along every step of their journey, and in doing so, you will learn the true meaning of perseverance and self-pride -- attributes that all children should have in bounty. 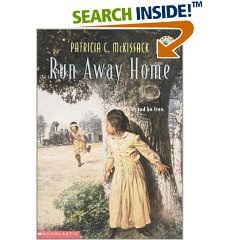 The following is an analysis of two of Ms. McKissack's books: Run Away Home, published in 1997, and A Friendship for Today, published ten years later in 2007. Though each book is set in a different time period, they both center around a main character who is preteen and female. In Run Away Home, the story takes place in rural Alabama, 1888. The main themes in this book are respect for cultural differen ces, family unity and perseverance. McKissack pulls from her own African American and Native American ancestry to write a book that discusses the little-known relationship between these two cultures during a period in time when both cultures were being treated deplorably by the racist, Southern-white majority. In Run Away Home, we meet Sarah Crossman, who is an eleven-year old only child who adores her parents, her simple lifestyle, and her dog Buster. However, Sarah gets much more than she bargained for when she and her mother rescue a very sick runaway Apache boy whom Sarah had witnessed escaping from the train that runs through her town. What follows is a heartwarming story about how two children from very different cultures learn to respect and trust one another so deeply, despite their differences, that they become brother and sister in all ways other than blood. Though this is the human aspect of McKissack's novel, she is meanwhile teaching her readers about the important historical events that were occurring during this time period. African Americans had only recently been freed in the South, and most faced danger and death at almost every turn. The white Supremacist group, Knights of the Southern Order, was terrorizing men who attempted to vote, threatening families who were trying to better themselves financially, and burning down the homes of African Americans who tried to stand up against them. Even though this book deals with a lot of painful history, it is important that these stories still be told. McKissack addresses the issues eloquently by telling the story through the eyes of an innocent child. In A Friendship for Today, the setting is now Kirkland, Missouri, "a town just outside of St. Louis" in 1954. The Supreme Court has just ordered that all schools be desegregated based on the landmark decision in Brown vs. Board of Education. The major themes in this book are personal character, friendship, and racial prejudice. In this novel, the main character is now twelve-year-old Rosemary Patterson. The story begins with Rosemary and her best friend J.J. having just completed the fifth grade at an all-black school that will be closing its doors forever. Of their whole class, only Rosemary and J.J. will be attending the brand new Robertson Elementary School. Though the idea of going to an all-white school next year is very scary to Rosemary, she feels a lot better because she will be doing it right alongside her best friend in the whole wide world. Then tragedy strikes, forcing Rosemary to desegregate Robertson all by herself! Patricia McKissack artfully tells the story of a young girl who has an incredible responsibility placed upon her shoulders -- to change history. Along with historical events, this book (similar to Run Away Home) deals with several relationship themes as well. Rosemary faces the imminent divorce of her parents and feels as though her father no longer loves her. Rosemary worries about betraying her best friend J.J. by developing new friendships with some of the "white girls" at school. Life has suddenly gotten difficult for a young girl to whom most things, like the A's on her report cards and beating even the fastest boys in a race, has always come easy. Readers take Rosemary's journey of hardship and self-discovery right along with her. We feel her discomfort from being assigned to a building full of people who are different from her, many of whom don't want her there at all. We feel her anger and frustration when people call Rosemary by racial slurs. We feel her pride when she displays courage in both her words and actions. This book is about protecting one's own good character by treating everyone with respect, regardless of whether or not they show the same in return. There are several similarities and differences that can be addressed with regard to each of the described novels. Both books focus on characters who have a strong sense of who they are, which certainly helps them in overcoming the many obstacles they have to face. These characters are also very open-minded, allowing them to form strong, supportive bonds with people who they'd considered "different" from themselves, only to discover that they weren't so different after all. Also contained in both books is a strong connection to African American culture, such as through the frequent discussion of superstition -- a common theme found in African American literature, and language that reflects the distinct vernacular of the particular time and place described within each novel. Both of these novels put a strong emphasis onto character description, making it easy for readers to visualize the different players within each of the stories. There are also distinct differences between the two novels. One such difference would be that of the social class of the main character. In Run Away Home, Sarah's family is very poor; they are barely able to make ends meet and are in danger of losing their farm. After experiencing a failed crop, much of the plot involves Papa trying to save the family home from being taken over by the racist whites in town. In A Friendship for Today, however, Rosemary's family could be described as middle class. They live in a nice home; both of Rosemary's parents are self-employed and running successful businesses. There is no discussion of financial hardship within Rosemary's family throughout the book. Despite such class differences, though, many of the issues faced by each of the main characters are similar: racial discrimination, fear for safety, and injustice. Another noteable difference between the two novels is the amount of power that each of the main characters realistically has to fight against the unfair treatment they are experiencing. In Run Away Home, Sarah and her family have incredible limitations placed upon what they can say and do to speak out, because doing so might cause the family to be physically hurt or killed. In A Friendship for Today, Rosemary has a great deal more freedom to speak up for herself without fearing for her life, as the times are much different. When discussing these differences, it becomes obvious that author Patricia McKissack has put an enormous amount of effort into researching the historical materal that is the basis of her fictional novels. It is extremely important to her that she accurately reflect the true attitudes and realistic dangers for African Americans during those respective time periods. Each of these novels will provide readers some insight into what it might have been like to live during these time periods. Much like a movie, we can live vicariously through these characters to see what they saw and feel how they felt. Only the very best authors can do that, and Patricia McKissack is certainly one of those authors! Now...let's get to reading! * For Some Extra Fun: After reading some of Patricia McKissack's books, test your knowledge about the author herself, and about some of the material from her many novels by clicking on this link.